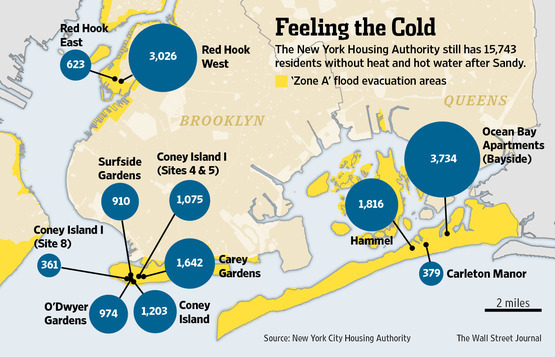 As electricity returned on Wednesday for every New York City public-housing resident, another dangerous impact from superstorm Sandy lingered: More than 15,000 of those residents have no heat with a cold snap descending on the region. More than one-fifth of the 386 New York City Housing Authority’s buildings damaged by Sandy didn’t have heat or hot water Tuesday. City officials said urgent efforts were under way to install temporary boilers in developments where a historic storm had overwhelmed electrical and heating systems. 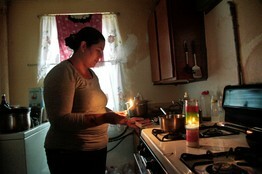 Associated Press Angela Saez, in her kitchen in the Red Hook Houses complex on Tuesday, had been without power, heat and hot water since Sandy hit. With temperatures falling to below 40 degrees at night, the heating situation in public-housing complexes—where some of the city’s poorest people live—was drawing increasingly sharp criticism. It comes after many residents didn’t get power back for two weeks. And electricity remains out in many of those neighborhoods, where floodlights illuminate the streets at night. Assemblyman Hakeem Jeffries, who was recently elected to Congress to represent Coney Island and Canarsie, among other areas, compared NYCHA’s storm performance unfavorably to the Metropolitan Transportation Authority, which has been lauded for returning transit service quickly after Sandy. “The failure to adequately provide heat, hot water and electricity in NYCHA buildings in a timely fashion is a scandal that is growing in proportion by the day,” he said. NYCHA Chairman John Rhea said heat and hot water should return to all public-housing residents by the end of this week. He said the storm damaged more than 400 public-housing buildings—twice as many as expected. In Coney Island, nearly 15-feet of sea water knocked out walls, left corroded wiring, clogged equipment and submerged boiler rooms that provide heat. “It’s been an arduous task just given the level of damage throughout our system,” Mr. Rhea said. He said his agency had rushed to procure more than 90 generators and 25 tanker-size temporary mobile boilers from as far away as Texas to tend to the crisis. The lack of heat was affecting residents in the Red Hook and Coney Island neighborhoods of Brooklyn and on the Rockaway Peninsula in Queens, where residents said they were bundling up in their homes, sleeping close to each other and boiling water to keep warm. In the Red Hook Houses, where 3,649 people had no heat Wednesday, Lissette Maldonado has developed a routine for keeping the five children in her care warm inside a second-floor apartment. Boiling water remains on the stove constantly creating steam. The six sleep in the living room to be closer to the stove. Showers are a towel scrub of hot water from a tub. Two space heaters also help. On Wednesday afternoon, a NYCHA employee—one of many who had volunteered to check on residents—knocked on her door. “You got lights?” the employee asked. “Oh, I don’t know,” the employee said. Returning heat to public developments has proved to be more difficult than electricity. Severe flooding resulted in extensive damage to electronic equipment in housing complex basements. Officials said a stubbornly high water table in coastal areas since the storm has resulted in water entering the basements again, even after it has been pumped out. Officials have procured boilers from across the country, but once one arrives, workers need to tether it to a building so it can reach existing pipes, which Mr. Rhea said is a two- to three-day process. City Council Member Domenic M. Recchia Jr., who represents Coney Island, reserved judgment on NYCHA. City Council Member Sara Gonzalez, who represents Red Hook, said some of the delay in returning heat to housing complexes happened because NYCHA was making needed changes to prepare for future storms. Electrical plants have been installed in waterproof boxes, she said, and heating plants have been moved to safer locations with special insulation. Some city officials argued that they restored power faster than private developers of housing for the poor on the Rockaway Peninsula and Coney Island. Private landlords said the city housing authority had superior resources. —Andrew Grossman and Laura Kusisto contributed to this article. A version of this article appeared November 15, 2012, on page A21 in the U.S. edition of The Wall Street Journal, with the headline: Power Is On, but Some Still Shiver.